Quick - what's the easiest and most reliable way to get your favorite DVD movies and video files onto your computer, phone, or other platform? If you said MacX DVD Video Converter Pro Pack, then you must be clairvoyant, because not only would you be correct, but MacX DVD Video Converter Pro Pack is also today's discount software promotion! MacX DVD Video Converter Pro Pack combines MacX DVD Ripper Pro and MacX Video Converter Pro to satisfy all of your DVD ripping and format conversion needs. With MacX DVD Video Converter Pro Pack, you'll be able to easily port your DVDs and video files to formats that are perfectly compatible with a wide variety of gadgets, including Mac computers, iPhones, iPads, Apple TV, devices that run on Android, and so much more. MacX DVD Ripper Pro is the only tool you'll need to make digital copies of your DVD movies in MP4, FLV, MOV, and a host of other formats, and is constantly updated to let you decrypt the latest releases. And if you need your videos in a specific format, MacX Video Converter Pro makes it a simple affair to convert your files to a number of popular HD and SD formats. Along the way, experiment with different parameter settings, clip and trim videos, crop and merge, and extract audio and still images from your media files. After you purchase MacX DVD Video Converter Pro Pack it may be used indefinitely. 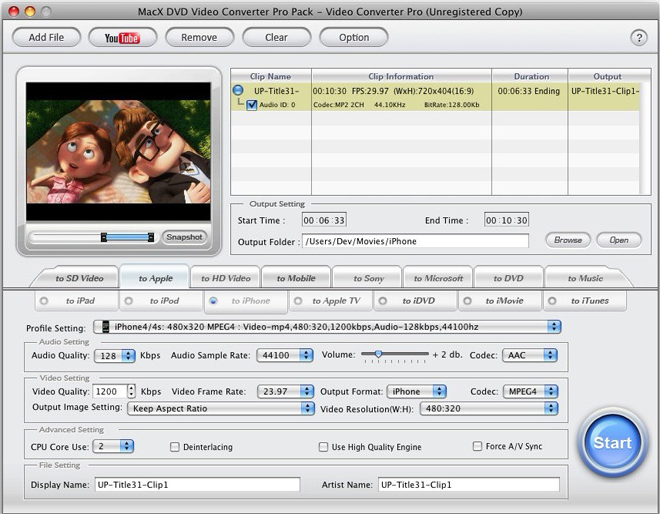 MacX DVD Video Converter Pro Pack is licensed per computer, and not per user. Brandy Hall I have backed up my DVD's to my hard drive (Video_TS Folders). Will it allow me to convert them Apple TV format from the files on my HD? Sabrina Lee @Brandy Yep, you can load DVD folder (Video_TS) then choose Apple TV profile, MacX DVD Ripper Pro would help you fulfill the converting task. SRCASTK I had in My Cart this combo just last week 4 $17.95. I asked if both came with the Purchase, but received no reply!!! NOW the price is roughly 120% HIGHER THAN LAST WEEK, AND THE ITEMS WERE JACKED OUT OF MY CART... WTF BITSDUJOUR??? I NEED BOTH PRODUCTS FOR SEVERAL APPLE/WINDOWS APPLICATIONS. I WANT TO CONVERT MY CDs, DVDs, XBox360 DISCS, PLAYSTATION 3 DISCS, OLD PROGRAMMING DISCS, and NINTENDO DISCS INTO DIGITAL FILES. I HAVE 100s OF DISCS TO CONVERT, AND ONLY WANTED THE BEST SOFTWARE THAT WOULD'VE BEEN UP TO THE TASK... I GUESS NOW I'LL HAVE TO KEEP LOOKING, BECAUSE I'M REFUSING TO PAY ROUGHLY 120% MORE THAN I WOULD'VE LAST WEEK!!! Constantin Florea @SRCASTK, The current EveryDay deal we have for this product is at $39.95 and the price for this deal hasn't changed in a very long time (beginning of 2013). In order to participate in this promotion, you can add the product again to the cart by pressing the Get This Deal button at the top and going through with the purchase flow.